Summer reaches fever pitch as Cebu plays host to the Ipanema Summer Sunscream 2015 this weekend at the Green Lagoon Park beach resort in Compostela. 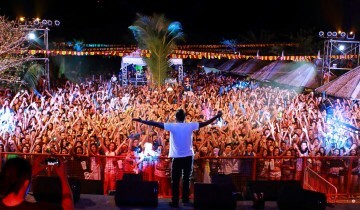 Tickets are still available to summer’s biggest and grandest party that’s bannered by top bands and DJs. Buy online at www.tselive.org or visit the ticketing outlets at the third floor Customer Service Counter in SM City Cebu, Ayala Center Cebu Concierge Desk, or Waterfront Cebu City Hotel and Casino concerts and events counter. You may also call 0925-520-0222 or 0917-321-6875 for additional details. Worried about transport to and from the venue? Don’t be. Free transfers are available. Coasters depart from The Walk in AsiaTown IT Park for Green Lagoon every 30 minutes from 8 am to 8 pm on May 23. Departures from Green Lagoon Park back to The Walk also take place every 30 minutes, from 2 to 5 am on May 24. NON-STOP PARTY. Ipanema Summer Sunscream 2015 is P800 for 19 hours of nonstop Indie and electronic dance music by top bands and DJs. Super bands Kamikaze and Urbandub, along with Powerspoonz and Franco, and international DJs Vega, Conan, and Korean duo The Phenomenon are headlining the music festival. Twenty-seven of the country’s finest DJs, including X Factor, Funk Avy and Cebu’s Jack Stone and War Aballe, will perform in the event as well. Actress, model and calendar girl Roxanne Barcelo will co-host with Cebu’s Tom Candy. The Summer Sunscream, now on its eighth year, is presented by Ipanema. It has grown to become the country’s biggest summer event, packing crowds of up to 15,000. It includes two summer events, the Rider Beach Volley Tournament and the Rider Dip & Dash Aquathlon. The two-day volleyball tourney features players from the esteemed University Athletic Association of the Philippines (UAAP) league. University of Sto. Tomas (UST) and Adamson University (AU) will play against Cebu CESAFI’s University of San Jose-Recoletos (USJR), University of San Carlos (USC), University of Southern Philippines (USP) and Southwestern University (SWU). The Rider Dip & Dash Aquathlon, set on May 23, has categories for full distance (2 km swim + 10 km run), half distance (1 km swim + 5 km run), and the fun category (500-meter swim + 2.5 k run).